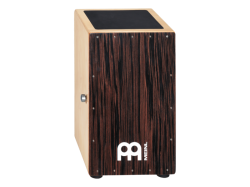 The snares touch the frontplate from the inside and deliver the classical cajon sound, which is requisite in Flamenco music. A knurled knob adjusts the amount of pressure used to press the snare wires against the frontplate. The rattle effect ranges between light and sensitive to very loud can be achieved through adjustment. The entire snare unit can even be turned off completely. Address: 3325 North 10th St.